This has been an interesting week for warmachine, hasn’t it! I normally do my Warmachine /Hordes posts on Tuesday and something else on Thursday, But I am glad I waited. 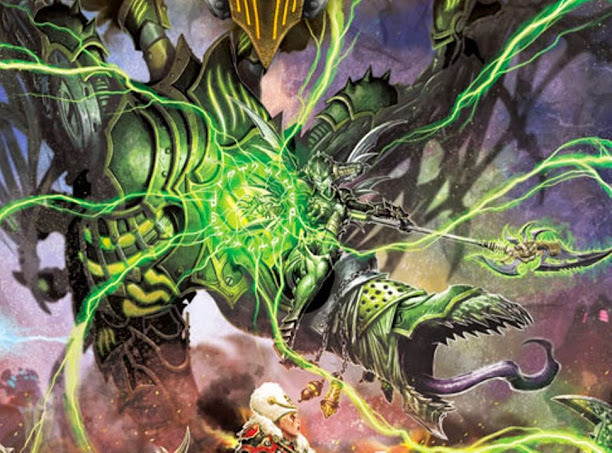 Tuesday had the cover of the next Warmachine book – Reckoning – come out, and today had complete spoilers of two more entries from that book, joining Dynamo and Moros. I’ll just go in chronological order here, simply so I hope I remember whats happening. Man, Is that thing cool. This completes the Cryx Cycle and the answers to all the MK I hullabaloo about Cryx being simply a comical villain. Since the dawn of MK II, when Khador finished taking Northguard and collapsed the Cygnaran Northern front, the focus of the villain of the story has been on the Nightmare Empire. Wrath, Vengeance and now Reckoning portray each of the three original factions battling it out with Cryx. I expect that we’ll have a new villain here soon. The first thing I notice is the giant, nearly legionesque, beast that is front and center. While it could herald a Cavalry model, I think its large enough to be a huge base, and that means a battle engine caster. Taking a look at the rider, we see that she has Witch Barbs, a Spear, and a very familiar horned head. While I was initially skeptical that this was going to be Deneghra again, because the vital scar was missing above her belly button, I’m convinced it can’t be anyone else. Further, if you take a look int he front of the cover, on the right, I believe that that is indisputably Nightmare, who’s last appearance was getting smashed to bits by one of the first Conquests to stride the battlefield. He is Deneghras’ Character jack, and I can’t see him being depicted with anyone else. The last little tidbit about the Cryxian Warwitch right there is that she is casting Grave Wind. we know this because the runes around her hand have been translated in a time honored tradition dating back to the first MKII forces book. This is a simple upkeep spell that grants +2 Def and Poltergeist to a target model. That’s strange, considering she is casting it on both Nightmare and a Slayer simultaneously. 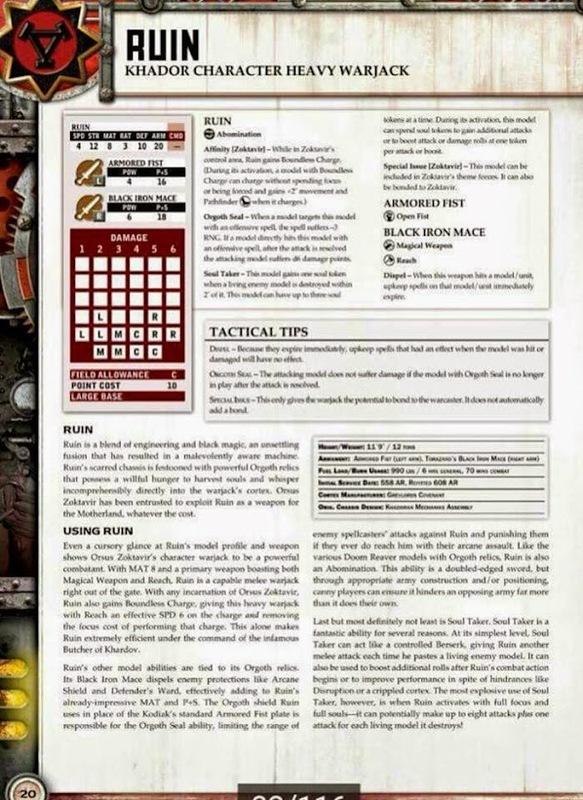 Maybe she has some insanely good ability similar to this: When a model casts an upkeep spell on itself, all models in the battlegroup are affected by the spell as well. This counts as a single instance of the spell being in play. I think something like this is more possible because she has 4 other crackling energy beams going in every direction, possibly affecting other models around her. So, we have Deneghra 3 Riding a Necromechanical Dragon fighting, what appears to be Zerkova 2. She’s traded in her Orgoth Trinket, and abandoned her Warm Cloak for a greatcoat. She is supposedly casting Spellpiercer, which would be bananas. Giving all models in her control area blessed, magic weapons would be just awesome. She also has two bodyguards, which i suppose means that she is going to be another warcaster unit. I would love for them to have been a more support type unit, like the Hunters Grimm, but Doomreavers don’t scream support to me. If it is a Warcaster unit, though, I expect her to have spellward. In this day and age, though, I don’t know how good it’ll be. They also look distinctly different, with different armor and helms. Maybe all three are characters, like Rhoven and company. FInally, in the background we have a Cephalyx Warden and Dynamo with who looks to be Nemo, but its so blurry we can’t tell. It turns out, I didn’t know I wanted Deneghra 3 this bad, and the Cryx Joy in me just keeps building. I don’t think I am going to make it through a year of Skorne! When I do get back to playing Cryx, though, I’ll be using Denny 3 and Goreshade 3. Neither of them have seen the table yet, and its high past time Goreshade made it. I hope I manage to make it out of the Battle Engine Caster phase of PP as a winner, because both of my factions Battle Engines are nearly unusable. We will see! The next beauty that popped on my screen was this monstrosity: Ruin! And, man is he a beast. While he is a stock standard Khador jack in many of his stats, his MAT 8 stands out like a shinning beacon of wonder, and what he is swinging, a P+S 18 Black Iron Mace with Dispel, Magic Weapon, and Reach is pretty amazing. Combine that with his Soul Taker ability, and he is going to start wrecking infantry. The current meta, especially in Baltimore, is not going to like it. After the first hit it is extremely likely that he can take out multiple Cetratii without breaking a sweat. Warders are going to drop, especially under Butcher 3, with Grievous Wounds. His affinity solves almost all the problems that Khador has with jacks, making him a speed 6 pathfinder jack. The Orgoth seal is going to punish a ton of the spellcasters that litter the game now. Druids, Battlemages, Warwitch Sirens to name a few. Aiyanna even has a 33% chance of just screaming to death after she casts Kiss on Ruin, and that’s not insignificant. Soul Taker is the one that has me the most riveted, though. Just having that ability to smash to pieces every infantry model that could even be near where I end is just beautiful. One completely glorious thing I can think of is trampling over infantry to get to a big ol target. Every model Ruin passes over and ends within 2″ of is going to be available to feul him, and it could easily turn 2 bought attacks into 5. I am so glad I have an Oceans 18 list and am building a Butcher list. This little red monster is going to be flat out insane, and I am ok with that! These just look so cool and fun, I don’t know how to express it. Appropriately costed, both vulnerable and strong. Each model has the capacity for multiple attacks. Each model has 5 wounds at 14/12, which is pretty solidly not good. Pistols are very short range. Mat 7 on the melee models, and RAT 7 on the Shooter. Weaponmasters. Swashbucklers. Eyeless sight on the ranged model. This feels like a mercenary character unit that is stacked with rules like the Withershadow Combine or Maximus. Each and every rule makes me giddy to get them on the table and start using them. Working with Cryx means they can be extremely useful with Deneghra 1, working with Mercs means that they can get snipe from Magnus, Roths Mercy from Fiona, True Grit from MacBane, and even can be included in a Pirates Life with Shae. Its a good time to play Cryx, and an awesome time to play Warmachine. But, then, when isn’t!